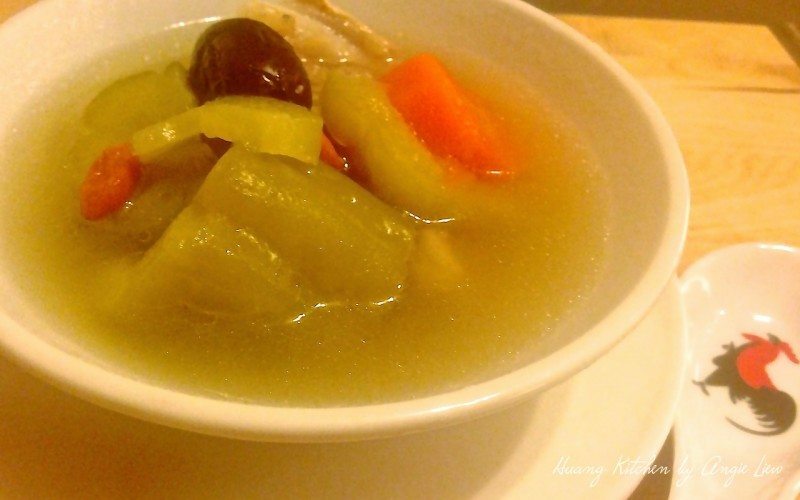 Healthy Chinese style soup with cooling properties. Bitter Gourd, also called Bitter Melon, has an acquired taste. You either love the bitter taste or you hate it. Bitter gourd soup is very often cooked by the Chinese when the weather is hot as it is believed to have cooling effects. It’s loaded with bitter gourd, meaty pork ribs, red dates, carrot and wolfberries. A very healthy and nutritious soup especially for those who love bitter gourd. 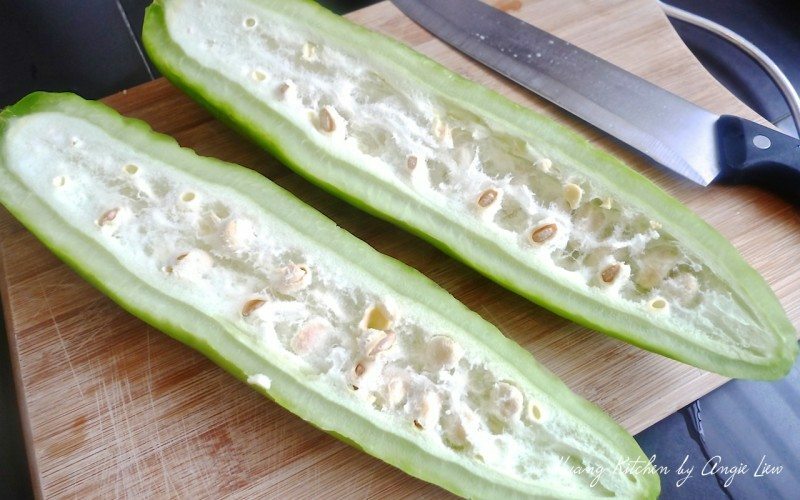 Bitter gourd, also called Bitter melon, has an acquired taste. You either love the bitter taste or you hate it. Bitter gourd soup is very often cooked by the chinese when the weather is hot as it is believed to have cooling properties. 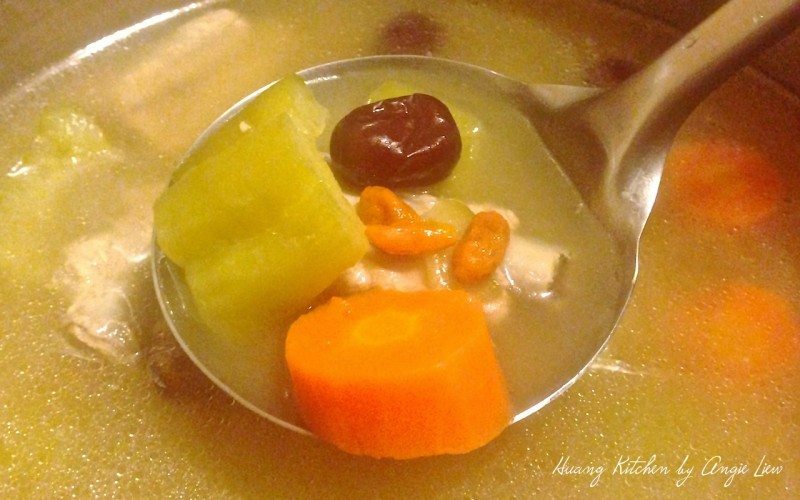 It's loaded with pork ribs, bitter gourd itself, some red dates, carrot and wolfberries. A very healthy and nutritious soup. 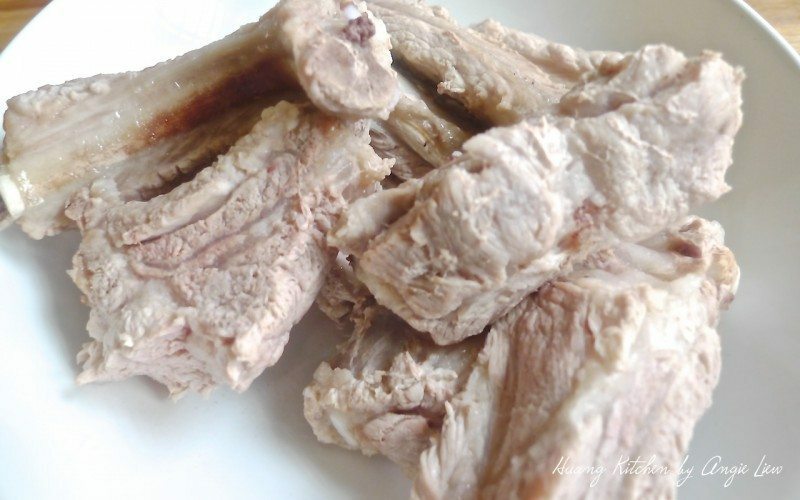 Blanch pork ribs in boiling water for about 5 minutes to remove scum. This will ensure a clear soup. Cut the bitter gourd in half lengthwise. Use a spoon to scoop out the seeds. Then rub a small amount of salt on the bitter gourd and then rinse off the salt with water. 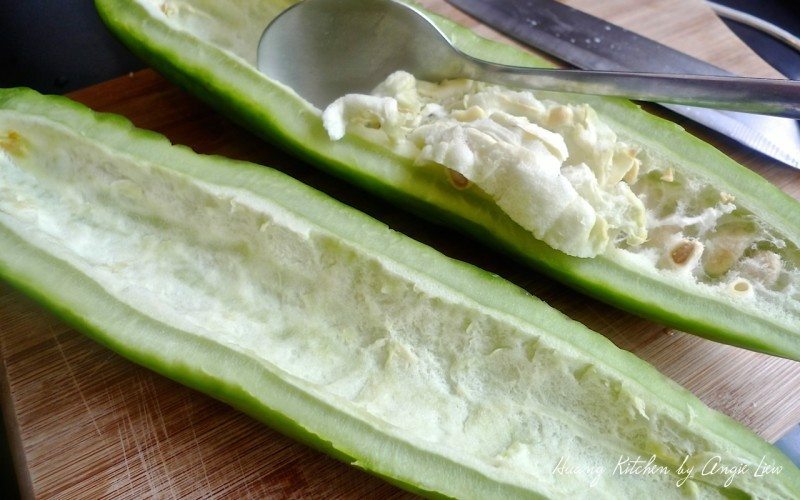 This helps to reduce the bitter taste of bitter gourd. Cut the bitter gourd into large chunks. 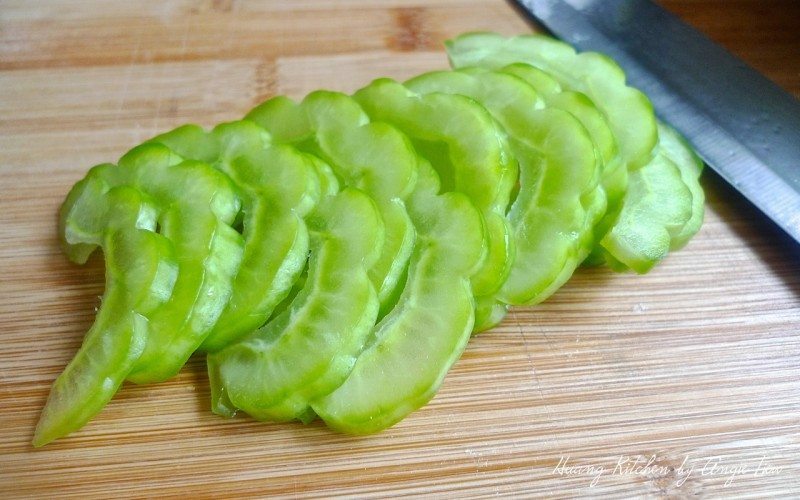 Slice one of the large chunks into thin slices and set aside. In a large soup pot, add in 2 litres of water. Bring to a boil. 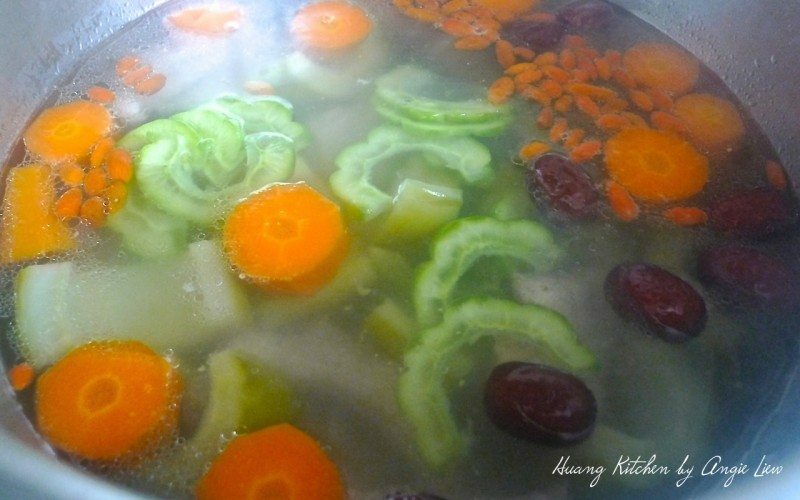 Then add blanched pork ribs, red dates, carrots and large bitter gourd chunks. When the water comes to a boil again, lower heat and simmer for 45 - 60 minutes. Then 10 minutes before you turn off the flame, add the soaked wolf berries and thin bitter gourd slices. Season with salt to taste. First wash and clean some meaty pork ribs. 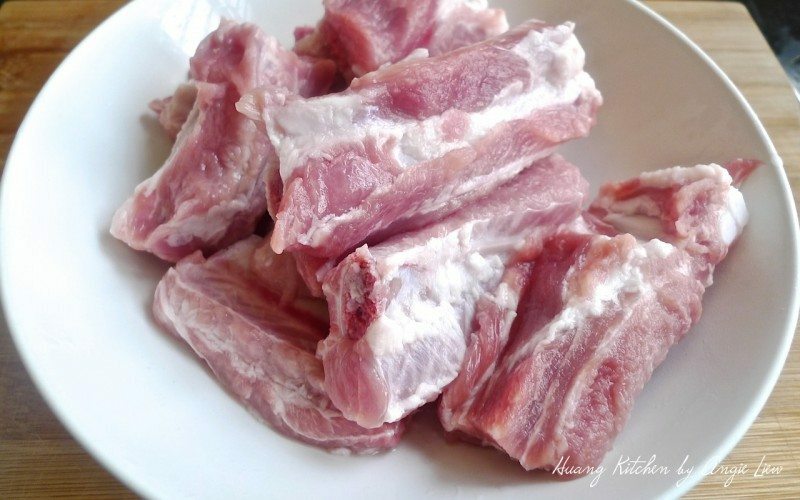 Remove the pork ribs from the boiling water and set aside. Wash well a medium size bitter gourd. It’s best to choose those bitter gourd with wide pattern lines in between and are light pale green in colour as these won’t be too bitter for the soup. 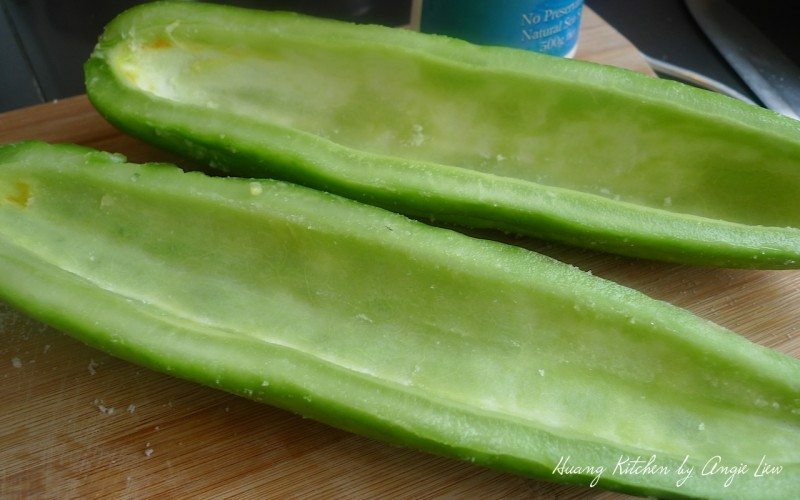 Cut the bitter gourd in half lengthwise. 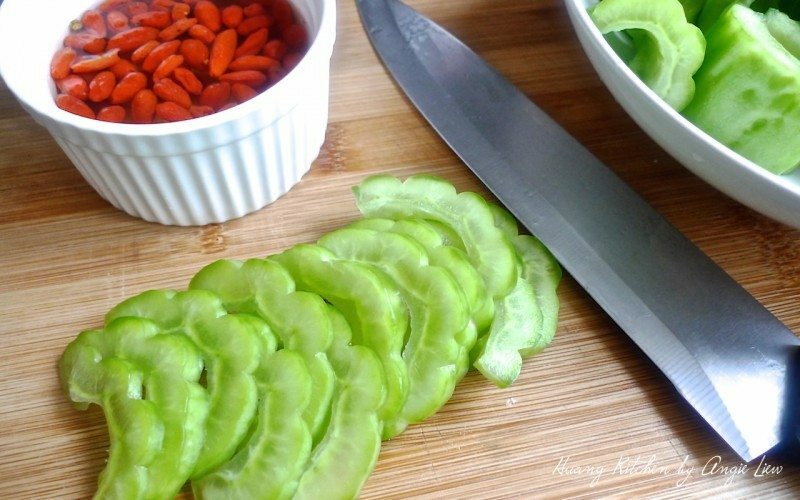 Use a spoon to scoop out the seeds. Then rub a small amount of salt on the bitter gourd. Rinse off the salt with water. 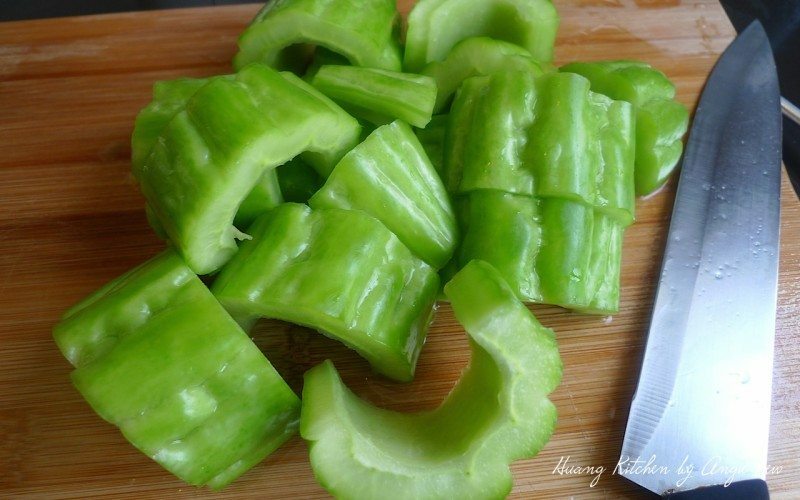 Cut the bitter gourd into large chunks. Slice one of the large chunks into thin slices and set aside. 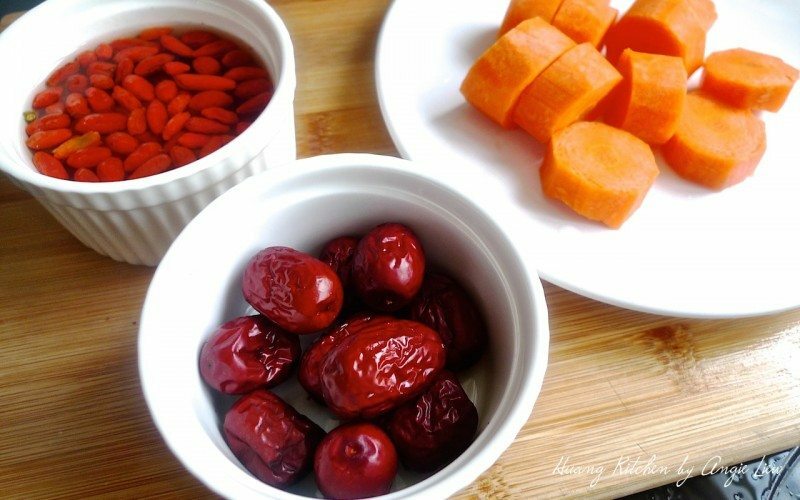 Cut a carrot into 1 inch thick rings, soaked wolfberries in water till fluffy and wash some pitted red dates. Set aside the fluffy wolf berries and slices of bitter gourd for later use. In a large soup pot, add in the 2 litres of water. Bring to a boil. 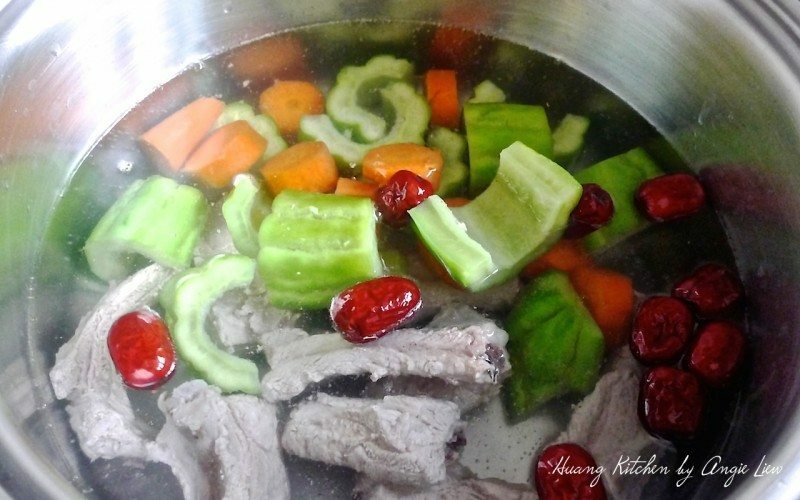 Then add blanched pork ribs, red dates, carrot and large bitter gourd chunks. 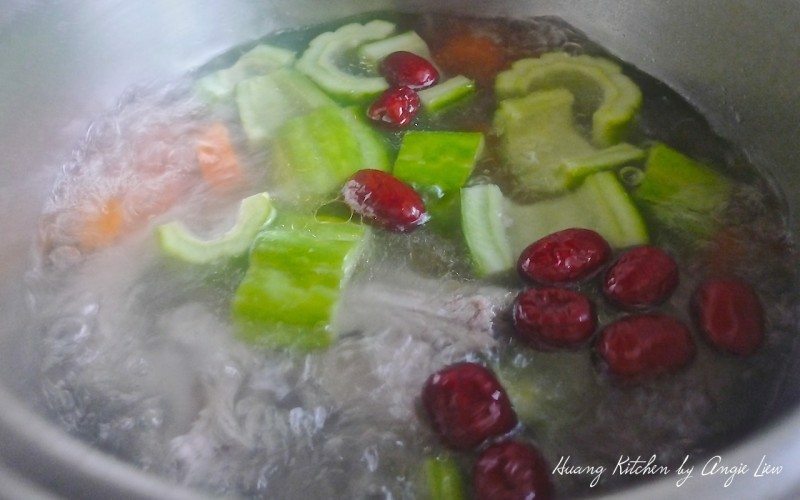 When the water comes to a boil again, lower heat and simmer for 45 – 50 minutes. 10 minutes before you turn off the flame, add the fluffy wolfberries and thin bitter gourd slices. Lastly add salt to taste. And you’re done! Serve the soup warm with steamed rice.